As I alluded to in my earlier post “Why Aren’t Dermatologists More Involved in Wound Care”, many dermatologists shy away from treating wounds, with some citing lack of confidence in their ability to offer appropriate care to patients. However, the treatment of wounds can be simplified by a stepwise approach. The first step to properly treating a wound is to properly assess it. This concept was addressed by our research group in the article “Systematic Approach to Wound Dressings” available from the Journal of Drugs in Dermatology. In this article, we put forth an algorithm for properly assessing wounds in the clinical setting. The guiding principles of this algorithm can be summed up by the following questions that clinicians should be asking themselves every time a new wound is assessed. What was the cause of the wound? 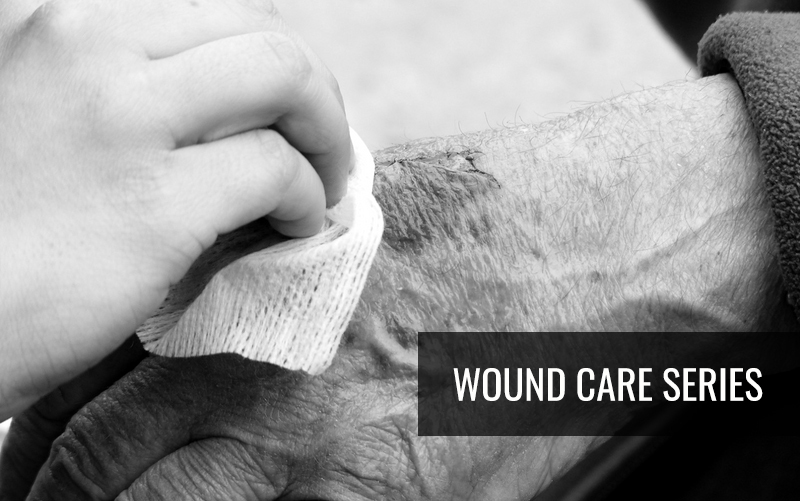 Understanding how a wound occurred is key to formulating a treatment plan for the current wound and, in some cases, very important for preventing similar wounds in the future. For instance, patients who present with open wounds due to venous insufficiency should have the appropriate workup and treatment for the primary condition together with proper wound care to help alleviate the cause of the wound. In the case of a pressure ulcer, mechanical interventions such as more frequent turning may need to be implemented to protect the wound from trauma and prevent more of the same insults from damaging the skin. Clearly, there are some exceptions to this rule, such as in the case of accidental burns or lacerations. However, addressing the underlying cause will allow for better wound healing and prevention of similar wounds down the line. Necrotic tissue can complicate wound healing in two key ways. Firstly, it acts as a barrier to the formation of new granulation tissue in the wound bed, which can significantly increase the time to wound closure. Secondly, dead tissue can act as a medium of the growth of microbes within the wound, leading to local or even systemic infection. If necrotic tissue is present, it should be derided prior to wound dressing. The type of debridement depends on the nature and extent of necrosis, and can include surgical, mechanical or chemical methods. In the last few years, there has been a trend away from empiric antibiotic treatment for wounds with good reason. It has been shown that antimicrobials such as silver sulfadiazine can actually extend wound healing times, and may not prevent infection of the wound at all. However, if signs of infection are present within a wound, they must be addressed. The nature of the infection will dictate what type of antimicrobial is indicated: superficial infections may clear with topical antibiotics alone, while deeper infections may call for systemic antibiotic therapy, or even debridement. Infected wounds may also require the selection of a dressing with antimicrobial properties, such as silver or iodine-containing dressings. What is the level of exudate? “If it’s wet make it dry, if it’s dry make it wet” has been one of the key tenets of wound care for years and it still holds true. It has been shown that moist wounds heal more quickly than dry wounds by several mechanisms. The accumulation of wound fluid leads to a higher concentration of growth factors within the wound bed, which are crucial to angiogenesis and tissue remodeling. Furthermore, wound fluid will create an electrical gradient between the wound and surrounding normal skin, resulting in increased migration of epidermal cells. However, there can be too much of a good thing when it comes to exudate. Excessive exudate can lead to maceration of tissue and a resultant delay in wound healing time. Assessing the level of exudate will allow for the proper selection of either hydrating or absorbent wound dressings. Previous PostPrevious It’s Pop Quiz Friday 7/27! Can you get it right?